I have heard my share of some bizarre legends from haunted bathrooms to curse underwear. Earlier this week, a friend told me of this most odd myth about a spirit that I had to share with everyone. Comes to no surprise that the origin of this ghost comes from Japan. This country’s folklore holds many tales on how humans, animal and even inanimate objects could turn into spirits or demons, otherwise known as yokai. The story I was told is this week’s posting about an umbrella becoming the Kasa-obake. The legend of the Kasa-obake has existed in Japanese folklore for centuries. It is part of group of yokai called Tsukumogami which are inanimate items that become sentient and self-aware. The myths stem from superstitious that tools, old furniture, jewelry or any other household object had spirits, could be possessed or become a demon. In some legends, these objects when neglected, tossed aside or forgotten would come alive and seek out revenge on their previous owners. Image those old gaming consoles you got rid of over a decade ago coming back to haunt you. There are a few stories told of items transforming into spirits after some time, a century for example. The umbrella has been part of Japanese culture and like any other item it’s used and discarded. In the legend of the Kasa-obake, it comes to life as a vengeful yokai and would seek out to its former owner to haunt for being neglected. This spirit is depicted as an umbrella with one eye, jumping around on one leg with a long tongue. In some myths, the Kasa-obake is also described to have two legs, a humanoid body and even wearing sandals. There maybe some differences in the yokai appearance, but the same moral exists in all the legend to treat one’s property with respect or risk its wrath. 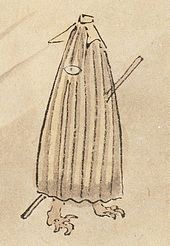 The Kasa-obake appears in a number of literature over the centuries in Japan. The origin of this yokai is believed to be more made up for entertainment than those mention in folklore to be eyewitness accounts. Today this spirit is used to amuse people in the form of manga, anime, movies, haunted house and toys for children. This entry was posted in Legends and tagged Legends, Monster on February 20, 2016 by Gatekeeper. Wow, that’s a new one on me. Very bizarre. Thanks for sharing! Thanks for reading Mae. There are a number of interesting and unusual legend from Japan I learn this week. Will be posting more in the future.